If you only know this from the CD, you're in for a three-dimensional, textural shock. If you don't know this record at all, you're in for the same shock. The sonics are superb, from the three-dimensional imaging and soundstaging to the ultra-transparency and rich atmospherics, this double LP set has it all. But more importantly, the production, the playing, the arranging and especially the sultry Wilson's vocalizing are transfixing. 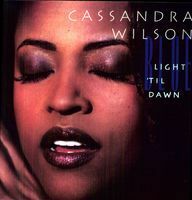 Blue Light 'til Dawn has not lost an iota of musical impact since first being issued in 1993 but it has gained a great deal of sonic stature. Highly recommended! "The British audiophile label Pure Pleasure has given Wilson’s album the royal audiophile LP treatment with re-mastering by Blue Note’s Ron McMaster, done at Capitol Studios. The CD release has been languorously stretched out over two LPs with none of the sides exceeding fifteen minutes. Right off with the Side A initial track, “You Don’t Know What Love Is,” you immediately hear the improvement in acoustics. Cassandra’s smoky, sultry phrasing matched to the steel string guitar’s tone, and Charlie Burnham’s violin set a mood that grabs your attention and tells you something special is happening here. Wilson’s delivery is impeccable and heartfelt. The soundstage is wide and crystal clear." - Jeff Krow, Audaud.com, 4.5 Stars! !